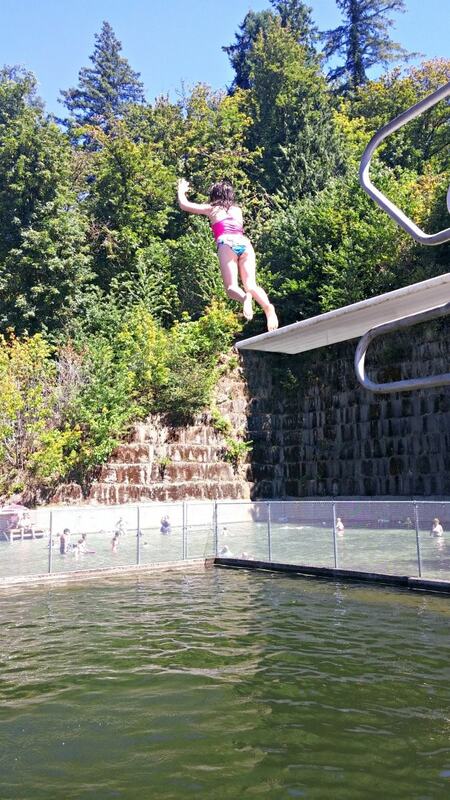 We recently visited the Rock Quarry Pool in Tenino Washington. I have lived in this state for much of my life, and never heard of it. 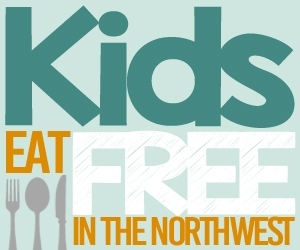 When I mentioned that I wanted to visit in the Thrifty Northwest Mom Facebook group, many of you wanted more information on it as well, so I thought I would share a review of our visit her for you all. The kids loved it! All four kids gave it a thumbs up, and would want to go back. I thought it was definitely worth a trip out, but I am not sure I would head back too often – just because of how crowded it gets and its hard to find a spot to set up camp. I do think it is well worth at least one visit though, to experience the uniqueness of it all! 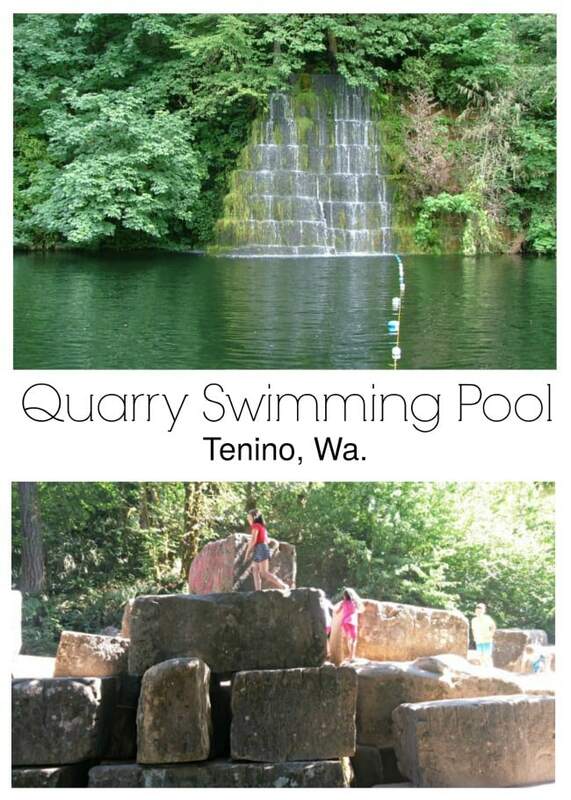 History: You can learn more about the history of Tenino and the Quarry Pool here (it is an old rock quarry)! Hours: Thursday to Sunday, Noon to 6pm (open for 2016 from July 1 to August 28). Opening is dependent on weather so be sure to check they are open if you are driving a distance to visit. The shallow end is on the far right of this picture, and the deep end is on the left of picture. They are separated by this chain link fence. 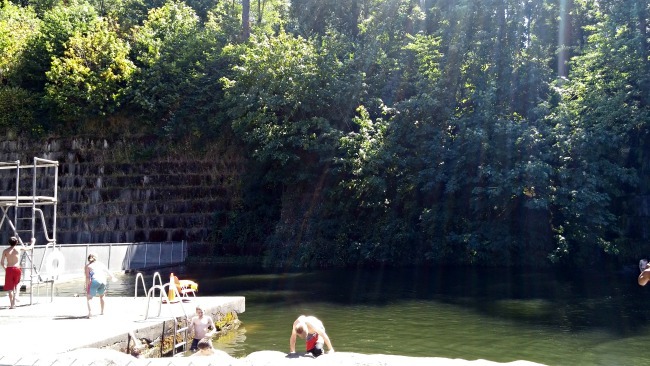 The Quarry pool is made up of two pools – a shallow end and a deep end. They are fenced off between them, and you have to take a swim test to be able to go into the deep end. View of the waterfall. 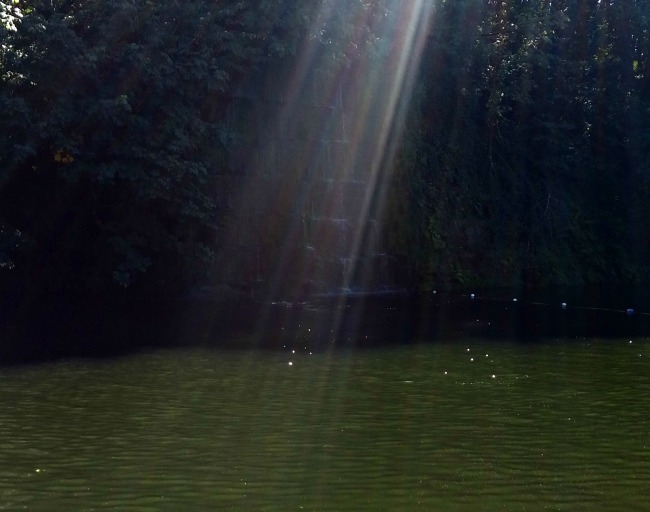 The sun was shining so brightly on the day we visited, that I did not do a great job of catching the beauty of it – but you can see the waterfall coming down the back of the quarry through the sun rays above. The beauty of the pool was wonderful. There is a huge rock wall as your backdrop, and some waterfalls on one side. If you have little ones, there is lots of wading space. 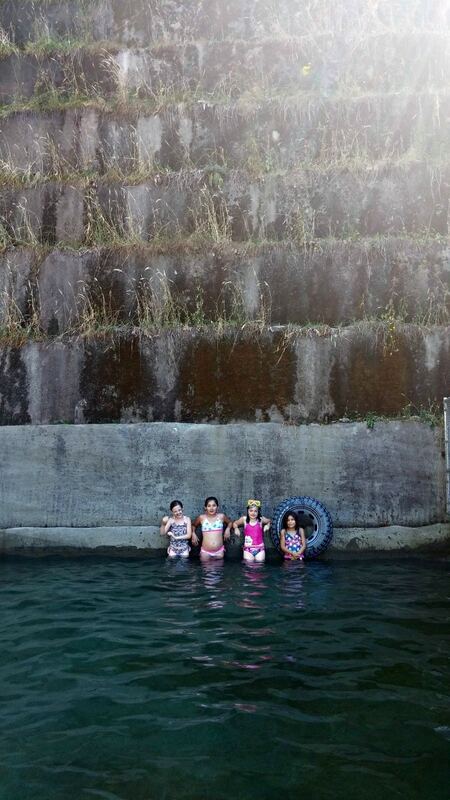 The shallow area only came up to my oldest child’s waist, and there was plenty of room for everyone to play. That beautiful large rock wall is the backdrop, and the water was cool and refreshing. The deep end has a low dive and high dive for kids to jump off of. This was a real highlight for the bigger kids I had with me. Space to relax outside of the pool is minimal. Once the pool gets crowded (and it was when we visited), there is really no place to set up camp outside of the pool itself. We basically had to find a spot to drop our towels and then spent the day in the pools. Another view of the deep end, on the other side of the diving boards. Its quieter over here, but was mostly used by teens when we visited. Most of the families with younger kids were over on the shallow end side where all kids can play. If you have kids of mixed ages, it was more difficult to keep an eye on them. I had 4 kids with me, and two could pass the swim test, and two were too young. As a result, I had to pull the younger kids out of the water and have them sit around while the older kids swam in the deep end and used the high and low diving boards. If your older kids are strong swimmers, this might not be an issue for you, but there is no shallow ground in the deep end (except right where you enter) and the two oldest I had with me were 9 and 10, so I was not comfortable leaving them over there by themselves. There are lifeguards, but they are young. They do blast some music out of a “boom box” near the bathrooms. This may be a pro for you if you like the music, or a con if you were hoping to enjoy the beauty of the area without it. This one will depend on your personal taste. 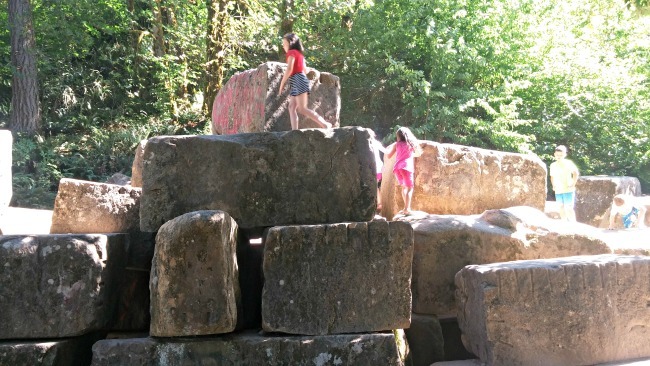 Right outside the Quarry pool is this big rock climbing structure that my kids loved playing on, There is also a big hill up the back of it and trails they can explore (tip – be sure to have extra clothes on hand – they get dirty on that hill). This is the park that is right next to the Quarry pool too, if you wanted to bring a picnic and enjoy or just let the kids have some time to run around. 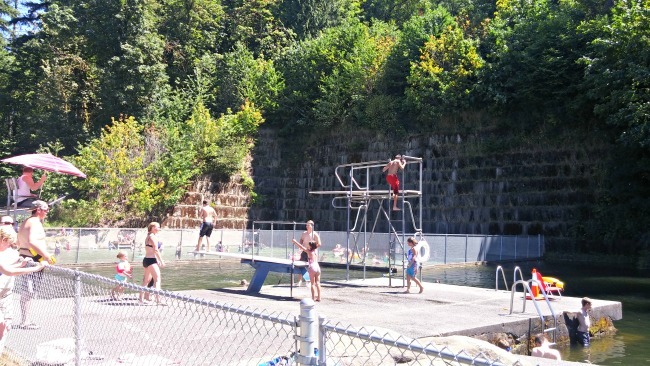 The little town of Tenino is a few blocks from the pool too. You could walk easily, or drive up for lunch or a visit to the candy store as well. Millersylvania State Park is in the area. Besides regular camping, there is a local spot that offers Glamping! This is one that my mom and aunt stayed at just this past week, and they highly recommend it. There is even a deal on Living Social right now! Great Wolf Lodge is not far from there, if you want to make it a family fun getaway. Thanks for the great and informative review!! Pictures and a Mom’s point of view are excellent!! I can’t believe I’ve never heard of it either, and I’ve lived my life in Tacoma/Seattle. Just down the road we used to go camping at Capitol Forrest’s various campgrounds, when the kids were younger. That was back before everyone found out about what a good deal it was, free wood, cheap or free camping, and mostly fairly peaceful, and you always had plenty of space. VERY scenic, and great hikes too! Have you mentioned Apes Caves, down by Cougar/Kelso area? That’s a good family day-trip, and interesting spelunking! Hi Chris – Thanks for those tips. 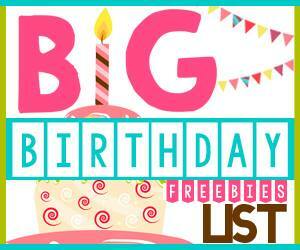 We have a post on free campgrounds and I am not sure we have that one listed (Capitol Forrest), so will double check on that! I have not been to the Ape caves yet (Sia) but I do believe Jens family has been. I need to add that one to my list of must see things – so thank you for that! !